Play Wolf Gold Slot Online with 500 Free Spins! 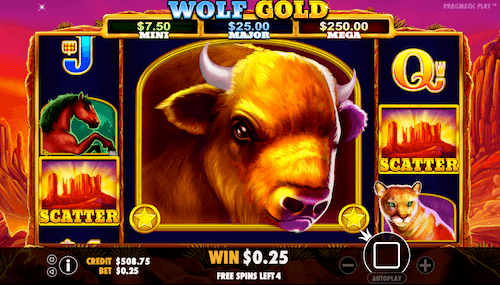 Wolf Gold is a 5 reel, 25 payline online slots game made by Pragmatic Play. It has a Free Spins bonus with Epic middle reel icons and Money Respin feature when 6 or more moons appear. Wolf Gold Slot Game has an RTP of 96%. Pragmatic Play offer this online slot, with a 5x3 reel layout, containing 25 paylines and an RTP of 96%. It’s a game themed around animals and nature, boasting both re-spins and free spins as two completely different bonus features, with healthy jackpots to be won. Wolf Gold has been a huge success for Pragmatic Play, but despite the title, it’s about far more than just wolves! The setting for this game takes us to the very heart of Native American culture. The playing area is set against dark, mysterious and beautiful canyons, with graphical qualities that are reminiscent of a Disney movie. It’s a modern online slot, which was launched in 2017, but it also has a hint of the classics about it both in style and execution. Rather than offering an overwhelming number of bonus features, it restricts itself to just a couple, and makes sure that they’re done well, and provide a genuine chance of boosting your winnings. Striking the balance between old and new is something that many slot developers strive for, and we think Pragmatic Play have done an excellent job here. You don’t need to concern yourself with what ‘wolf gold’ might actually be; wolves don’t have any use for gold as far as we’re aware, and solving that riddle isn’t part of the game! Just focus on the world of the wolf itself as it roams those canyons, accompanied by backing music and sounds that suggest there may be other dangerous animals out there, too. In fact, if you keep your eyes peeled, you’ll see much more wildlife than our four-legged prairie friends. Turning our attention to the reels, the lower card values are made up of the traditional playing card symbols, running from J through to A. Above them we have a wild cat, a horse, a buffalo and an eagle, which come in at a range of different values. Wolves tend to be wild out in nature, and so the wolf in this game is, too. He’ll replace any symbol to make winning lines for you; with one exception. Keep your eyes peeled for the stacks of rocks, which are the game’s scatter. There’s also one more standard symbol - the full moon - which has implications for the game’s bonus features. The aesthetic of the game is immersive, with graphics that are sharp and bold without taking attention away from the gameplay. Wolf Gold has a few bonus round features, let us start with the epic Wolf Gold free spins bonus round. This bonus round is triggered by at least three CANYON symbol as shown below. This then presents the player with a new bonus round set of reels that has a giant central reel that covers the usual reels 2,3 and 4. In each free spin one single giant symbol fills the whole central area, allowing huge potential for epic wins. Additional Wolf Gold free play spins can be won during the bonus feature and there are no limits to the free spin and it can be re-triggered each time 3x canyon symbols land in the reels. One of the key features of Wolf Gold slot is the Money Respin feature. When 6 or more moon symbols fill the reels this feature is triggered. The feature starts with 3 respins that can be re-triggered when another moon symbol lands in one of the empty spaces. When the feature is complete all of the amounts add together and if all 15 positions are filled this triggers the MEGA JACKPOT. The amounts in the moons are randomly assigned and can also take on the MINI and MAJOR Jackpot values. Although it isn’t uncommon for modern online slot releases to be packed full of several bonus rounds, Wolf Gold isn’t one of them. The base game is well-put together and well thought-out, so it only needs a couple of strong bonus offerings on top of it to make the game feel complete. The first of those bonus features is a very solid free spins feature. You can get the feature started by landing three scatter symbols in the appropriate places; that’s on reels one, three and five. You’ll recognize them straight away; they have the word ‘SCATTER’ printed right across the middle of them in a bold yellow font! You only get five free spins when the round is first triggered, although the feature can be re-triggered by finding more scatters whilst it’s live. To boost your chances of a win, reels two three and four are connected for the entire duration of the free spins by way of a massive symbol three rows high and three reels wide. The second, and more original bonus feature, is the money re-spin, which we’ve also seen called jackpot mode elsewhere. You’ll want to keep your eyes peeled for the full moon symbols to trigger it. Instead of turning your wolf into a werewolf - which doesn’t happen because this isn’t a horror-themed slot - they combine to create a quirky and unique feature. Six of the symbols in total anywhere on the reels are your trigger. When that happens, every other symbol on the reels disappears other than those moons, and you have three free spins in which you’ll want to find even more moons to add to your collection. If you find one, you get an additional three free spins. This round will end one of two ways; either you’ll run out of free spins, at which point the game will reward you with a cash prize relative to the number of moons you have, and your original stake, or you’ll have moons on every space on the reels. Obviously the latter is harder to achieve, but if you can manage it, you’ll win the largest jackpot the game offers. That’s potentially huge! Wolf Gold is one of the best Pragmatic Play slots and despite being one of the newest developers in the market, they are already widely regardless as a high-quality game development studio with top games including Chilli Heat Online Slot and Mighty Kong. All games come with comprehensive game help files. The RTP for Wolf Gold is 96% and with easy access to the game on your mobile device, the time is now right to claim the biggest of jackpot prizes while playing this superb game. Rose Slots is one of the best Pragmatic Play casinos in the UK, so good luck and please gamble responsibly. Pragmatic Play has been around as a company since 2007. When it comes to online slots, they go big on attractive and slick designs, often focused around a theme. When you’re familiar with Pragmatic Play’s style, you’ll be able to spot their games without having to check. Their output is prolific, with more than 100 slot games released to date. Some of their best known and most successful slot games include Gold Rush, Wolf Gold, Great Rhino, Peking Luck, da Vinci’s Treasure and Madame Destiny. We offer a number of Pragmatic Play’s games right here at Rose Slots. Although they’re a comparatively young company, they’ve come a long way in the iGaming industry during the years they’ve been active. They specialise in slot games, but they also make scratchcards, roulette and casino games, and good old-fashioned bingo. Everything they create, they do in-house with their own design team. They’re especially focused on making games that are suitable for mobile play. They actually design their games on mobile devices first, and then port them backwards so they work on computers. They only use the programming language HTML5 when creating games, which might make it easier for them to be so versatile across different devices. HTML5 is an intelligent language, designed specifically to look and work the same no matter what kind of device it’s running on. Pragmatic Play have a mantra, which is ‘innovation and dedication’. They put that into practice by always releasing a minimum of two new games every month. That makes them one of the busiest developers in the industry. Not saying all that much about their creations is kind of Pragmatic Play’s thing; they prefer to keep the words short, and let the product do the talking. In the case of Wolf Gold, this is a game that’s more than capable of speaking - or howling - for itself! It’s a great game that’s been a huge hit for the developer, and they’re quite rightly very proud of it. Wolf Gold is still a comparatively new release for Pragmatic Play, having come out back in 2017. Perhaps for that reason, they haven’t created a direct sequel to it yet. That’s not to say they ever will; Pragmatic Play has so far never released a direct sequel to any of their games, and it doesn’t seem to be something they go for as a developer. They do have another game in their catalogue which uses the Wolf Game name, and images from the Wolf Game world, but sadly it isn’t an online slot. 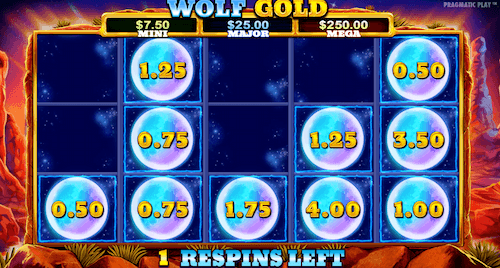 Wolf Gold Scratchcard: As the name implies, this is a scratchcard rather than a slot game. If you have no interest in scratchcards, you can move right along. If you do enjoy playing them though, and you’re also a Wolf Gold fan, then it may hold some appeal. 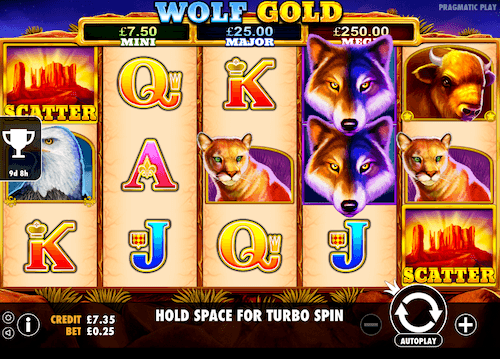 Much of the visual flair of the Wolf Gold slot appears in the scratchcard version, accompanied by the atmospheric sounds of the original game. Unusually for a scratch card game, there is a bonus feature; a ‘free play’ symbol may be revealed on your card, which allows you to play again for free. Of all the scratchcards currently offered by Pragmatic Play, this one pays out the highest amount, and with the most frequency. Matching any three symbols wins you the value of the symbol, which at the highest end could be a life-changing £1m. Be wary of the RTP if you’re a slot game player, though; scratchcards always have a lower return-to-player rate than slot games, and with the Wolf Gold Scratchcard, it varies between 67.03% up to a maximum of 74.48%. Hot Safari: We accept that wolves are not safari animals. That goes without saying. However if you’re a fan of atmospheric, animal-focused games, you might be as drawn to Hot Safari as you are to Wolf Gold; both of them go for a ‘realistic’ approach to their subject matter. The safari plains here are every bit as well realised as Wolf Gold’s canyons. Not only that, the functionality of the game is also similar; there are two bonus features, and they’re almost identical to the Wolf Gold offering. We think Pragmatic Play just ported the game world of Wolf Gold out to Africa, and changed the scenery and the cast to suit it. RTP comes in at 96.17%. We don’t know what it is about the appeal of wolves; which are historically seen as fierce and noble creatures, if a little savage and lonely; but many other developers have used them as a motif for their own creations. As Pragmatic Play have only one wolf-themed offering for their own players, here are some titles from elsewhere which may interest you. Big Bad Wolf: Here’s slot developer Quickspin, with a slot game that draws its theme from a fairy tale we were all told when we were young. It’s the three little pigs! When we first heard the fairy tale, we were all worried about how the pigs would escape from the scary wolf. In this game, the tables are turned, and you want the wolf to win. In fact, more than that, you become the wolf! The pigs appear on the reels, and it’s your job to hunt them down, so show them no mercy. The quirky and delightful main bonus feature in this game lets you attempt to blow down the house containing the three little pigs, with prizes on offer if you’re successful. This is a fun and frivolous game, with a cartoon-based design, and an atmosphere worlds away from the grim environment of Wolf Gold. It may not be as cool or atmospheric, but it’s entertaining to play. With an RTP of 97.34%, it’s also potentially quite a high payer. Wolf Hunters: Hunting down the wolf in Wolf Gold has the potential to bring you prizes. The same is true of Wolf Hunters, but you may wish to exercise a little more caution when you’re going about the hunt; because these aren’t any old wolves. In fact, they’re werewolves! There’s no mistaking the fact that this slot has a horror theme; it comes with a heavy and atmospheric Gothic charm. Your success in the game - and especially the bonus features - will hinge on how many weapons and traps you can make appear on the reels in order to fight off the wolves. Every time a wolf makes an appearance, a fight will break out between that wolf, any hunters on the reels either side of him, and any weapons available to that hunter. If the hunter is victorious, the wolf turns into a wild, and new winning lines can be formed. Wolf Hunters has a 3x5 layout and offers 96.3% RTP. Make sure you’re comfortable with the horror theme before you start playing, though. Wild Wolf: Of all the wolf-themed online slots out there, we think this one is closest to Wolf Gold, and it comes from the studio IGT. It pre-dates Wolf Gold by a few years, and so it looks a little more dated in its design, but that doesn’t take away from the fact that the base game is solid and fair. Elements it has in common with Wolf Gold include the canyon scenery, and the use of symbolism taken from the Native Americans. Free spins are on offer here too, along with stacking wilds. Wild Wolf actually started life as a physical slot machine before being converted for online slot players, and you still get a little of that old-school feel when you’re playing it. RTP comes in a little lower than Wolf Gold at 94.97%, and the overall feeling is that you’re playing an older relation of the Pragmatic Play slot. When we talked about Pragmatic Play earlier on, we mentioned that they operate on a ‘mobile first’ philosophy. Their games are designed for mobiles and hand-held devices first and then converted backwards so they work on laptops or desktops. Because of that, we expect Wolf Gold to perform exactly the same on our smartphone as it does on our computer. So were we disappointed when we tried it to find out? No, we weren’t. Pragmatic Play was true to form, and they’ve done a great job with the mobile version of Wolf Gold. The graphics are clean and sharp, the atmospheric soundtrack is still the same, and nothing at all has been cut out or reduced in quality. Even better, the game is clever enough to know which way up you’re holding your phone. Tilt it on its side, and watch as the buttons rearrange themselves to suit, without getting in the way of the reels or shrinking anything down to fit. Flip it back the right way up, and it will instantly correct itself again without pausing or causing errors. It looks easy, but it isn’t, and a lot of slot developers struggle with this. The functionality is so good here that you can even continuously press on the spin button and activate turbo spin mode. We wish every developer was this good at turning their online slots into mobile slots. Pragmatic Play has done an outstanding job with Wolf Gold, and deserve to be congratulated. Wolf Gold is still relatively new, but in the time it’s been out there, it’s been an award winner for Pragmatic Play and generated plenty of positive press. People just don’t have enough good things to say about the game, and here are some of the more recent articles about it we found when we went looking. The awards are still coming for the game, which is amazing when you consider it’s a couple of years old. Most recently, it won the overall ‘Best Slot Game’ award for 2018 at the Malta Gaming Awards. Considering how many slot games are released in a 12 month period, that’s a lot of competition, and an amazing accolade for both Wolf Gold and Pragmatic Play. Pragmatic Play went a step further though, and were named the winner of the ‘Innovation in Slot Provision’ award at a different ceremony. The popular blog website Calvin Ayre, belonging to Calvin Ayre himself (a very successful entrepreneur with strong links to the casino world), was happy to report the good news. 2018 was a great year in general for Pragmatic Play. As well as collecting awards wherever ceremonies were held, they also picked up a license to operate in Gibraltar, as the industry news website CasinoBeats reported. Gibraltar may not be a huge territory, but any new ground is good ground for a slot developer. Wolf Gold is specifically cited in the article as an example of Pragmatic Play’s quality output.